It's only a small article, but I'm really excited and happy that Choice Health & Wellbeing Magazine decided to publish it, after all every bit helps to spread the word about this wonderful therapy. I don't think the Dorn article is on their website yet, but if you get the magazine delivered or get the chance to pick up a copy, please give the article a read - I'd love to get your feedback. 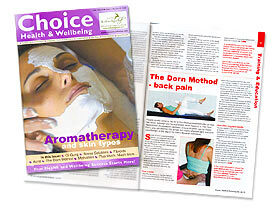 You can visit their website here: Choice Health & Wellbeing Magazine. Well done to all of the students who attended the very last Dorn Method workshop of the year held at Stratford upon Avon. (What a busy year it has been) Once again I have to say how nice it was to meet such interesting and lovely people. There's always this strange feeling after a workshop: I get to know everyone as friends and then after the two days is up, they all go off again! Still, I hope we can all meet up for practice days and I wish you all the very best of successs with your new Dorn skills. 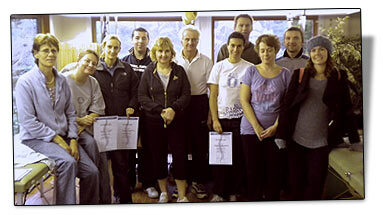 Congratulations to all of the students who attended the Virginia Water London workshop this November. It was a packed training and of course again such a lovely bunch of people to work with, I wish them all the very best of success with their new Dorn Method skills. Many thanks also to Sophie for making available such an excellent venue at Scorpio Clinics. This was my first visit to Dublin and I have to say it was a trip I'll never forget. I found the people of Ireland to be very welcoming and friendly, and that of course goes without saying for all the students on my Dorn Workshop too. So I must say a big thank you to all of them for being so welcoming and such good students. I'll be adding them to my Dorn Therapists Listing so if you need to find one in Dublin you know where to go; being Physical Therapists they're a very experienced bunch so I'm sure you'll be in good hands! Wow, what can I say! I’ve just come back from what can only be described as a fantastic two day Dorn event (Kongress) held in Stuttgart, Germany. The Kongress was in fact open to anybody, people with Back Pain looking for alternative treatment, as well as of course Complementary Therapists, and quite a few professional practitioners too. There was a great line up of speakers, starting off with Dieter Dorn talking about how Dorn touches people (not just physically :0), but on all levels). More than 10 doctors from different fields of expertise held talks about the Dorn Method from their own different perspectives. What I found great was that most of them use the Dorn Method successfully in their own clinics, whilst others referred their patients to Dorn Therapists. From all the talks I managed to listen to, and there were more than 18 individual talks plus around 30 workshops to choose from, it was certainly an action packed two days, not to mention all the exhibitors’ stands to look at. I think the main message that came across is that the Dorn Method touches people on all levels and is certain to grow all around the world; the picture above includes a world map upon which Dorn Trainers attached labels showing what country they are teaching Dorn. For more information, visit The Dorn Kongress website. 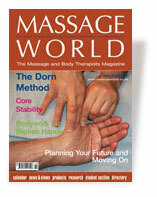 Massage World Magazine have just published my article introducing The Dorn Method in their latest August/September 2009 issue. It's a full featured 4 page article entitled 'A Revolutionary Approach to Back and Joint Pain', so if you get Massage World delivered please take a look. Please note though that they've not yet added the article to their website. I know how difficult and expensive it can be to build up business as a complementary Therapist, and so my aim is always to try to help where I can to get you going with your own Dorn practice. Whenever I treat people, I give them a small leaflet they can take away with them which is designed to help them understand how Dorn works, and which also offers a bit of background information and explanation covering The Dorn Method. So my latest addition to the Dorn Method supplies section is the leaflet I hand out to my clients. It's a wonderfully designed A4 leaflet which you can use to help promote your Dorn therapy as well as helping to inform and educate at the same time. For more information, please visit the supplies page. The Dorn Method is growing massively in Germany, and this year is the 7th organised congress holding many talks and workshops, and one of the guest speakers will be Dieter Dorn himself. Of course the only downside is that it's all in German, but if you do happen to speak the lingo, and fancy a nice getaway to the lovely town of Stuttgart, then this could be an ideal opportunity to experience the energy and growth surrounding The Dorn Method in Germany. I'm excited to announce my Dorn Method Workshops have now been accredited by the Federation of Holistic Therapists (FHT). This means Therapists coming on to the Workshops can gain valuable CPD (Continuing Professional Development) points, and of course The Dorn Method is now also covered by FHT Insurance. For more information, please visit the FHT website. For Therapists wishing to earn CPD points by coming onto my Workshops, and to receive relevant insurance from the FHT, you will need to have a Level 3 in Anatomy & Physiology with a qualification in body massage. Would you believe it, Dorn Method for Horses! I never thought I'd see the day that I would see a Dorn Therapist giving pelvis and leg corrections to a horse - that really was an experience I'll never forget! I sometimes get asked by people whether Dorn can be used on Animals as well as us humans, so I decided to try to do a bit of research for myself. 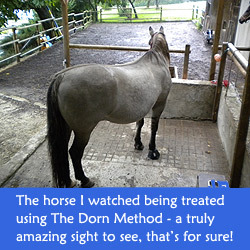 Unfortunately, I couldn't find anything here in the UK, but after a quick search on the net I discovered a lovely lady who actually uses The Dorn Method to treat Horses, not far away from my home town in Bavaria. Her name is Simone and her website can be found here (unfortunately all written in German): Dornmethode-pferde.de She has been treating horses using Dorn for quite some time now with a lot of success, and is therefore always very busy. I contacted Simone asking whether she would be kind enough to meet with me, so I could learn more about what she does. To my delight she told me she was actually going to be treating a horse whilst I was on holiday visiting my parents nearby, and asked whether I'd like to come along. This was amazing luck and of course I said yes, I really wanted to see this! We had a 20 minute drive to a farm where the horse was located. The horse itself was having walking difficulties and needed treatment on it's hind legs and pelvis. Although it was a horse, the Dorn treatment I watched being performed all looked very familiar, with checks and dynamic corrections being done. However of course the horse can't be told to swing a leg to provide dynamic assistance, so that was the job of the owner, who had to help by moving the legs of the horse whilst the therapist did the correcting. The whole treatment took around 40 minutes, and included a lot of sweat and physical work. Afterwards on way back home, to show me some more horses Simone treated, we dropped off at a place called Walker Ranch. This was a western style ranch in Bavaria - now THAT was a whole other story: walker-ranch.de. I had a wonderful time demonstrating The Dorn Method at the NEC Holistic Health 2009 show, where I met so many lovely Therapists eager to find out more about Dorn; thank you all so much for your interest. It did get a little tiring after doing so many leg length checks(!) but at least people got to see how simple but powerful Dorn actually is. For those of you who asked about Workshops in your local area, please drop me an email to let me know where you live, to see if we can sort something out soon. I was recently invited to hold a Dorn Method talk in Leamington Spa, at the local Federation of Holistic Therapists (FHT) meeting. There were 25 people present, and I think everyone there enjoyed the evening as much as I did, it certainly gave me a good chance to show local therapists a good overview of the Dorn Method. In fact, two of the attendees are now coming to my next workshop, with another wanting to come along later in the year. I'm always keen to demonstrate how valuable The Dorn Method is for Therapists to learn, and just how beneficial it is as a treatment for back pain; so if you'd like me to hold a talk for your local group, then please do get in touch with me. I've just come back from a great Dorn Method get-together in Ottobeuren Germany, attended by Dieter Dorn himself as one of the guest speakers. The event was a yearly gathering, mainly to exchange ideas, and experiences, etc. It was a very nice trip, good to meet so many like minded and friendly Dornies! It's amazing to see the energy and excitement that Dorn has in Germany, but there again it has been going now for 35 years or more with literally thousands of Therapists including some Doctors who offer Dorn Therapy; all in all, providing lots of evidence that Dorn is growing strongly.